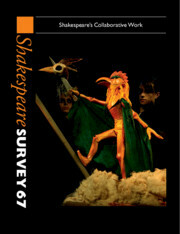 Shakespeare Survey is a yearbook of Shakespeare studies and productions. Since 1948, the Survey has published the best international scholarship in English and many of its essays have become classics of Shakespeare criticism. Each volume is devoted to a theme, or play, or group of plays; each also contains a section of reviews of that year's textual and critical studies and of the year's major British performances. The theme for Volume 67 is 'Shakespeare's Collaborative Work'. The complete set of Survey volumes is also available online at http://www.cambridge.org/online/shakespearesurvey. This fully searchable resource enables users to browse by author, essay and volume, search by play, theme and topic, and save and bookmark their results. What is Not Collaborative about Early Modern Drama in Performance and Print? Collaboration and Proprietary Authorship: Shakespeare et al.